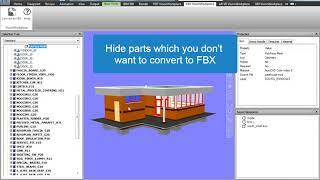 FBX is a proprietary file format (.fbx) developed by Kaydara and owned by Autodesk® since 2006. It is used to provide interoperability between digital content creation applications. FBX is also part of Autodesk Gameware, a series of video gamemiddleware. Create an FBX file of your design in a moment and share with anyone in one go. It will translate designs to FBX file that can be viewed using the free application 'Autodesk® FBX® Review' and other such platforms which support FBX, like Unity, Autodesk® Maya®, Autodesk® 3ds Max® etc..
Autodesk Navisworks 3D model can be distributed to a third party without the need to have Autodesk Navisworks in their system. 5. Selected parts can be converted and Hidden parts will be skipped. 7. Unity 3D compatible FBX. 8. Pixel culling. Skip small sized entities. The application is available in both versions, Trial Version as well as pro. 2. Add this license key in the About dialog and activate the plugin.